The court is one of 13 United States courts of appeals. Composed of 17 active judges, it is based at the John Minor Wisdom United States Court of Appeals Building in New Orleans, Louisiana, with the clerk's office located at the F. Edward Hebert Federal Building in New Orleans. The John Minor Wisdom U.S. Courthouse, home of the Fifth Circuit, New Orleans. This court was created by the Evarts Act on June 16, 1891, which moved the circuit judges and appellate jurisdiction from the Circuit Courts of the Fifth Circuit to this court. At the time of its creation, the Fifth Circuit covered Florida, Georgia, Alabama, Mississippi, Louisiana, and Texas. On June 25, 1948, the Panama Canal Zone was added to the Fifth Circuit by 62 Stat. 870. On October 1, 1981, under Pub.L. 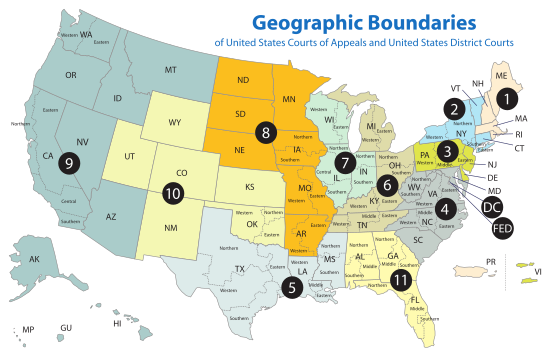 96–452, the Fifth Circuit was split: Alabama, Georgia, and Florida were moved to the new Eleventh Circuit. On March 31, 1982, the Fifth Circuit lost jurisdiction over the Panama Canal Zone, which was transferred to Panamanian control. During the late 1950s, Chief Judge Elbert Tuttle and three of his colleagues (John Minor Wisdom, John Brown, and Richard Rives) became known as the "Fifth Circuit Four", or simply "The Four", for decisions crucial in advancing the civil rights of African Americans. In this, they were usually opposed by their fellow Fifth Circuit Judge, Benjamin F. Cameron of Mississippi, until his death in 1964. Hurricane Katrina struck New Orleans on August 29, 2005, devastating the city and slightly damaging the John Minor Wisdom Courthouse. All deadlines concerning filings were extended. The court temporarily relocated its administrative operations to Houston, but has since returned to normal operations in New Orleans. 18 Richard Rives AL 1895–1982 1951–1966 1959–1960 1966–1981 Truman reassignment to 11th Cir. 19 Elbert Tuttle GA 1897–1996 1954–1968 1960–1967 1968–1981 Eisenhower reassignment to 11th Cir. 21 Warren Leroy Jones FL 1895–1993 1955–1966 — 1966–1981 Eisenhower reassignment to 11th Cir. 29 John Cooper Godbold AL 1920–2009 1966–1981 1981–1981 — L. Johnson reassignment to 11th Cir. 31 David W. Dyer FL 1910–1998 1966–1976 — 1976–1981 L. Johnson reassignment to 11th Cir. 32 John Milton Bryan Simpson FL 1903–1987 1966–1975 — 1975–1981 L. Johnson reassignment to 11th Cir. 34 Lewis Render Morgan GA 1913–2001 1968–1978 — 1978–1981 L. Johnson reassignment to 11th Cir. 38 Paul Hitch Roney FL 1921–2006 1970–1981 — — Nixon reassignment to 11th Cir. 40 Gerald Bard Tjoflat FL 1929–present 1975–1981 — — Ford reassignment to 11th Cir. 41 James Clinkscales Hill GA 1924–2017 1976–1981 — — Ford reassignment to 11th Cir. 42 Peter T. Fay FL 1929–present 1976–1981 — — Ford reassignment to 11th Cir. 44 Robert Smith Vance AL 1931–1989 1977–1981 — — Carter reassignment to 11th Cir. 45 Phyllis A. Kravitch GA 1920–2017 1979–1981 — — Carter reassignment to 11th Cir. 46 Frank Minis Johnson AL 1918–1999 1979–1981 — — Carter reassignment to 11th Cir. 47 R. Lanier Anderson III GA 1936–present 1979–1981 — — Carter reassignment to 11th Cir. 49 Joseph W. Hatchett FL 1932–present 1979–1981 — — Carter reassignment to 11th Cir. 50 Albert John Henderson GA 1920–1999 1979–1981 — — Carter reassignment to 11th Cir. 56 Thomas Alonzo Clark GA 1920–2005 1979–1981 — — Carter reassignment to 11th Cir. The court has had 29 seats for active judges. Twelve of these seats were reassigned to the United States Court of Appeals for the Eleventh Circuit, leaving a seventeen-seat court. The seats are numbered in the order in which they were filled. Judges who retire into senior status remain on the bench but leave their seat vacant. That seat is filled by the next circuit judge appointed by the president. ^ "Practitioner's Guide to the U.S. Court of Appeals for the Fifth Circuit" (PDF). Archived from the original (PDF) on 2011-06-13. Retrieved 2011-06-26. ^ "That Fascinating and Frenetic Fifth," Time Magazine, 1964-12-04. ^ "U. S. Court of Appeals for the Fifth Circuit". Official website of the Federal Judicial Center. Archived from the original on March 26, 2005. Retrieved June 19, 2005. ^ Pardee was appointed as a circuit judge for the Fifth Circuit in 1881 by James A. Garfield. The Judiciary Act of 1891 reassigned his seat to what is now the U.S. Court of Appeals for the Fifth Circuit. ^ a b Recess appointment, confirmed by the United States Senate at a later date. ^ Recess appointment, never confirmed or rejected by the Senate. Bass, Jack (1990). Unlikely Heroes. University of Alabama Press. ISBN 0-8173-0491-6. This page was last edited on 12 March 2019, at 21:38 (UTC).